Crackle Quartz •	Mineral Species: Quartz. •	Colour: Colourless to white, and many other colours (coloured varieties usually have different names). •	Typical Appearance: Usually prismatic crystals with steep pyramidal terminations, but may be bipyramidal or needle-like. Also massive. •	Birthstone: Aquarius (although in some systems it is considered an Astrological Stone for all signs •	Chakra Alignment: Crown; Balances all Chakras •	Element: All (Earth/Fire/Air/Water) •	Origin of Name & Mythology: From the German 'Quarz' •	Harmony •	Energy •	Healing •	Psychic abilities •	Clarity •	Calmness •	Known as the "master healer", will amplify energy and thought, as well as the effect of other crystals. •	Absorbs, stores, releases and regulates energy. •	Draws off negative energy of all kinds, neutralising background radiation, including electromagnetic smog or petrochemical emanations. •	Balances and revitalises the physical, mental, emotional and spiritual planes. •	Cleanses and enhances the organs and subtle bodies and acts as a deep soul cleanser, connecting the physical dimension with the mind. •	Enhances psychic abilities. •	Aids concentration and unlocks memory. •	Stimulates the immune system and brings the body into balance. •	Harmonises all the chakras and aligns the subtle bodies. •	Channel, transmit, cleanse and magnify energy, giving it many uses in crystal healing, meditation and spiritual work. •	Believed to bring clarity and focus to the mind, help decision making and enhance intellect. •	Main other attributes are its healing and cleansing powers. •	Clean energy believed to relieve pain and encourage healing. •	Used to cleanse the mind, body and spirit of negative energy and ailments, making it an endlessly versatile crystal. •	Retains the healing qualities of quartz as well as the chakra properties that have been introduced by the enhanced colour. 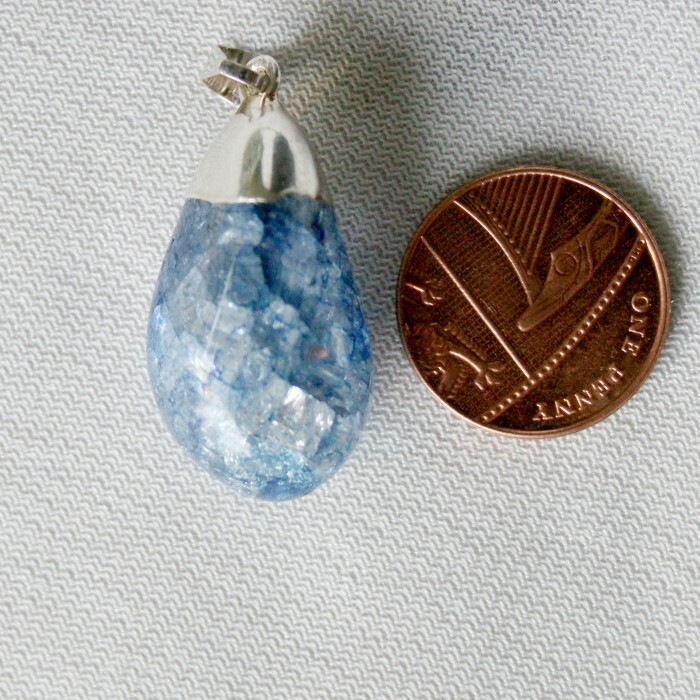 •	Pure Quartz crystal that has been super-heated and then dyed to give it vibrant colours. •	Children especially love the bright colours of Crackle Quartz. ~Aqua & Azure Crackle Quartz: •	Throat Chakra (Blue energy) •	The focus of communication and action. •	Imbalance in the Throat Chakra may manifest as shyness and an inability to make yourself heard, or as boisterousness and a tendency to talk when you should listen. •	Balance here allows easy communication and is helpful for public speaking.